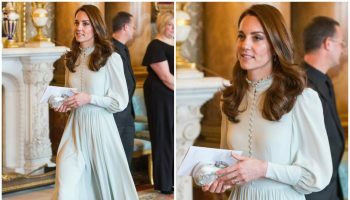 Catherine, Duchess of Cambridge was in attendance at the 2018 BAFTAs. She did not wear black like the other attendees wear which is a movement to support sexual assault, harassment and inequality in the entertainment industry. She wore a green Jenny Packham green dress styled with a Mascaro clutch.